1. 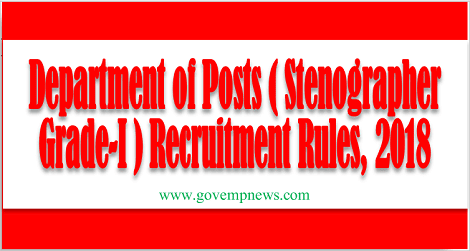 Short title and Commencement.—(1) These rules may be called the Department of Posts (Stenographer Grade-I) Recruitment Rules, 2018. 2. Number of posts, their classification and Level in the Pay Matrix.—The number of posts, their classification and Level in the Pay Matrix attached thereto shall be as specified in columns (2) to (4) of the Schedule annexed to the rules. 3. Method of recruitment, age limit, qualifications, etc.— The method of recruitment, age limit, qualifications and other matters relating to the said post shall be as specified in columns (5) to (13) of the said Schedule. (a) Who, has entered into or contracted a marriage with a person having a Spouse living; or. 5. Power to Relax.—Where the Central Government is of the opinion that it is necessary or expedient so to do, it may, by order, and for reasons to be recorded in writing, and in consultation with the Union Public Service Commission relax any of the provisions of these rules with respect of any class or category of persons. 6. Saving.— Nothing in these rules shall affect reservations, relaxation of age limit and other concessions required to be provided for the Scheduled Castes, the Scheduled Tribes, the Ex-serviceman, Other Backward Classes and other special categories of persons in accordance with the orders issued by the Central Government from time to time in this regard. The Departmental Stenographers Grade-II in respective Circle in the Level-4 (Rs.25,500 – 81,100) in the Pay Matrix with ten years regular service in the grade. Promotion shall be subject to completion of 2 to 4 weeks training in the field of duties or responsibilities of the promotional post of Stenographer Grade-I. Provided that those persons who have not completed training for promotion before the date of meeting of Departmental Promotion Committee shall also be considered subject to the conditions that the required training shall be completed within one year of the date of such meeting of Departmental Promotion Committee. However, those persons who are due to retire within two years may be exempted from completion of such training for promotion. Note: Where juniors who have completed their seniors would also be considered provided they are not short of the requisite qualifying or eligibility service by more than half of such qualifying or eligibility service, or two years, whichever is less, and have successfully completed their probation period for promotion to the next higher grade alongwith their juniors who have already completed such qualifying or eligibility service. (iii) with ten years service in the grade rendered after appointment thereto on a regular basis in posts in Level-4 (Rs. 25,500 – 81,100) in the Pay Matrix or equivalent in the parent cadre or department. Note: The departmental officers in the feeder category who are in the direct line of promotion shall not be eligible for consideration for appointment on deputation. Similarly, the deputationists shall not be eligible for consideration for appointment by promotion. 3. Senior Superintendent of Post Offices - Member. 3. Senior Superintendent of Post Offices – Member. Consultation with Union Public Service Commission not necessary.